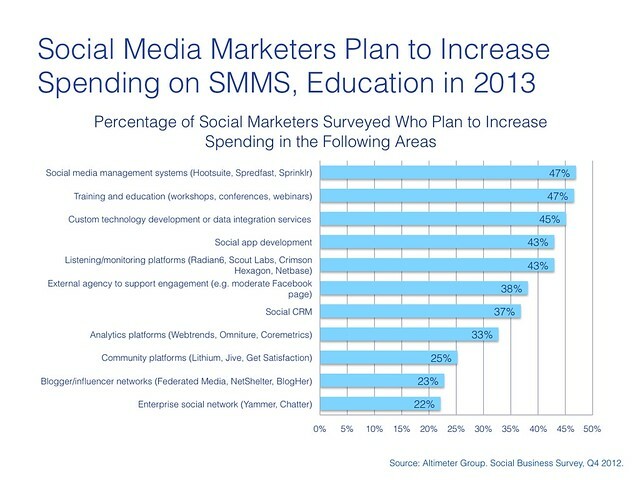 To manage proliferation in enterprise, marketers purchase social media management systems. Altimeter has been covering this software category since March 2010 (see all posts), and has published reports on how companies are managing social using software. These social media management system tools, which allow brands to manage marketing, support, and employee interaction of social continue to spread throughout the enterprise (data). We’ve also seen deal size for this specific market on the increase over the past few years, some deals crossing over the six figure dollar range. We’ve also found that companies are straddled with a number of social accounts (on average, 178 social media accounts) as social strategists struggle to avoid being constantly reactive in a role of social sanitation. Insufficient tools means investments in education programs key for employee masses. A solution requires a strategy, education, business processes, then with software to facilitate. While most marketers realize that technology is a key method to achieving their goals, they know that education within an enterprise is required for social business success. Marketers invest in educating various business units (departments, regions, and product groups) to ensure they properly know how to use these technologies and avoid risk. Yet, in our previous research, we’ve seen that brands are eager to educate, they don’t put large dollars against this investment. To help corporations solve this need, we’ve launched our own Academy offering, and are working with large brands, agencies, and consulting firms to roll-out. Surprise! Marketers “volun-told” as system integrators of fragmented software. The opposite of volunteering is being volun-told (credit: Zena Weist). Marketers have been VolunTold that they are unwilling system integrators in the era of VC funded startups who’ve created clones serving similar use cases. As a result, brand side marketers and their agency and consulting partners are investing in integration disparate software together to commonly share data, in order to manage a single customer journey, or obtain data on one persona or customer type. While Oracle, Adobe, Salesforce, IBM, and others offer suites, don’t expect this trend to go away anytime soon, as the proliferation of new web tools means that brands will forever be rushing to catch up. Summary: Companies seeking to scale social in their enterprise. So there you have it, today’s buyers are investing their resources and time on scaling social within their organization before it spirals out of control. They’re deploying software, coupled with internal training, and then trying to glue together many pieces into one system. While I’m not going to provide insights to each one of bullets, here are a number of other trends from this data that we can discuss in the comments.